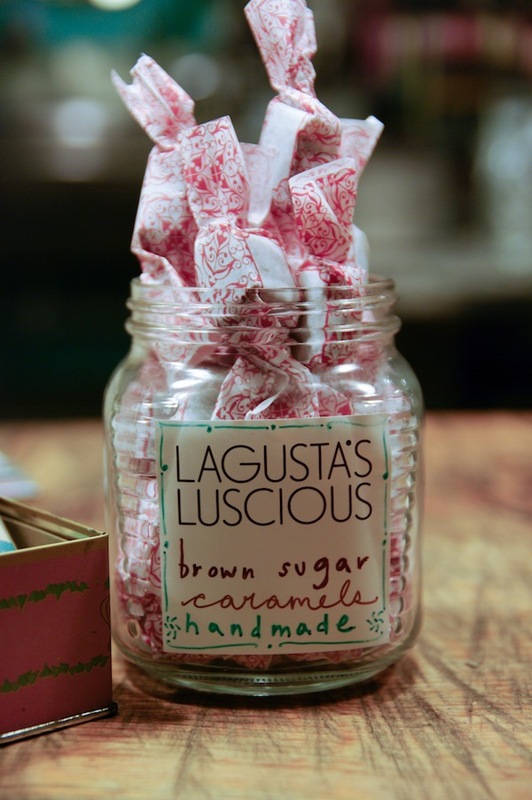 December | 2011 | Lagusta's Luscious! Hello and Happy December 28! In case the date isn’t as engraved on your heart as it is mine, December 28 means the shop has been open exactly six months! It’s been an amazingly fun half year. To celebrate, I put some beloved items we’ve previously only sold in the shop on the website for all to enjoy. Thanks so much for your patronage over the past 6 months in the shop, and the past years on the website. It’s such a pleasure making lovely things for you. On to the new products! Of ethics and capitalism. And the dreaded mixing of the two. And please tell me what you think of this email I sent to this person. I pride myself on being an activist running a capitalist business in an activisty way. My business is not a not-for-profit, and I promise never to come to you asking for money to help me improve or continue the business, without showing you a business plan and a repayment schedule. For-profits that ask for donations (the vegan world is chockablock with ’em) sicken me. I’ve borrowed money from every monied (and not-monied) pal I have, and I’ve always paid it back on time—with interest. That way, my business is my own. I’ve been a part of many co-ops, and my business isn’t a co-op for a reason—I’ve got crushing student loan payments, three mortgages, and an etsy.com addiction that all mean I’ve got to make this business work or else. I just can’t afford to share profits with anyone else if this business is going to succeed. I pay my employees worse than I’d like to but better than 99% of the rest of the food world, and I give them bonuses and chocolates and help them out when I can in other ways. When it comes right down to it, I’m here to make money while not compromising a pretty rock-solid set of ethical standards I’ve cultivated over the years. Both of those pillars—ethics and keeping an eye on the bottom line—are absolutely crucial to the success of this little enterprise. I try not to compromise, and I don’t pretend not to be a for-profit. I don’t want to make a ton of money, but I’d like to pay off a few bills and provide a few more good jobs and buy well-made clothes that cost a bit more (hellooooo etsy)—how cliched, to want to be doing this whole ethical American Dream thing in the political hellscape that is 2011, I know, I know. 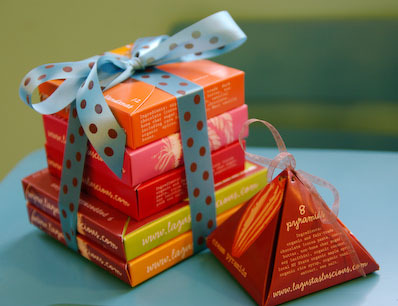 So when I got an opportunity for a local business—a really good nonprofit!—to buy their holiday chocolates at Lagusta’s Luscious instead of a very very mainstream, very very mall-y, very very much 100% using chocolate harvested in various questionable ways, from small African boys who have been taken from their families in very very questionable ways and made to work for no money picking cacao beans to middlemen keeping mega profits from cacao harvests themselves and using them to fund violent uprisings and drug empires, I could go on and on and on about the horrible things behind mainstream, mall-y, non-organic, non-fair-trade chocolate—I was excited. 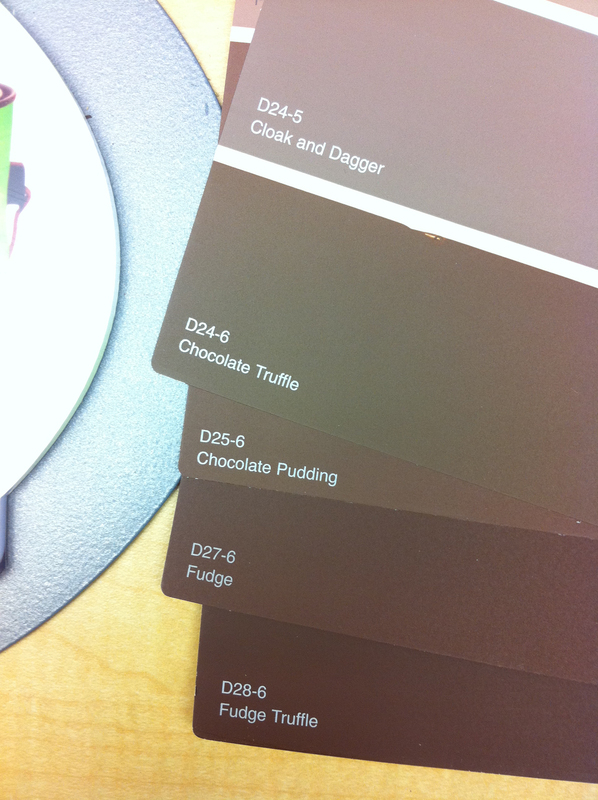 Also, the aforementioned company’s chocolates TASTE REALLY BAD. I’ve tasted all the chocolate of theirs my ethics will permit me to taste (the dark chocolates) and they are MIND-BLOWINGLY one-dimensional and waxy and processed and made of ick. AND they don’t include local ingredients, AND their stuff is made by machines and mostly likely never ever touched by human hands AND over-packaged in miles of plastic and styrofoam AND AND AND, obviously my wee little company, operating out of a 750 sq ft shop/world headquarters and run by a crazy vegan feminist anarchist obsessed with making chocolates so good you want to cry is, ah, quite a different thing entirely. Not only was it a large order (about $1000), it was a great opportunity to steal business from The Big Bad Mainstream Chocolate Company. Win win for a small local biz, right? The order needed to go out two days after Thanksgiving. It would be great start to what was to become our most wildly busy holiday season of all time. I told my little team about the possibility, and they were psyched to go for it, even though it would mean a couple days of extra-long hours. My contact at the non-profit was the assistant of the director, who met with me at the shop and, very politely and sweetly, told me that the deal was that if I could provide a similar amount of chocolate at a similar cost, they would be overjoyed to switch to me. 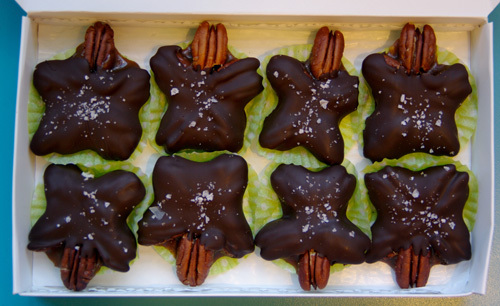 They wanted to send holiday gifts to about 18 clients of theirs, and pointed to the corporate gifts section of The Big Bad Mainsteam Chocolate Company’s catalog. I studied the catalog and said we could work something out, while giving my standard speech about why our chocolates cost more. She was receptive and understanding and sweet. Over the next dew days I spent hours working with her putting together 18 different special assortment towers that would be luxuriously decadent and made of truly ethical chocolate wrapped in ribbon made from vegetable cellulose that probably no one ever composts but me but you can if you want to! I worked really hard on getting this account. I told all my friends that I felt like I was in Mad Men, working on reeling in a big fish. But I didn’t ply my potential with martini lunches and low-cut blouses. I told her about my company, and why I thought we could provide a superior product. Don Draper I am not. 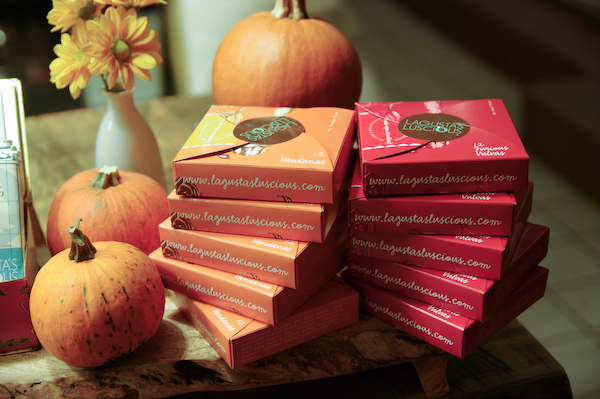 In the end, after cutting as much of a deal as I could cut, it came down to this: the $1000-$1200 (probably more like $1200 with shipping) she was going to spend at The Big Bad Mainstream Chocolate Company would cost $1542 with Lagusta’s Luscious. That included a substantial discount as well as a lot of personalized packages and service, handwritten notes to all her clients, gift wrapping, and more. I couldn’t go any lower, or else I wouldn’t make the profit necessary to keep propane in the $4k tank, or my employees paid, or or or or or. I couldn’t go any lower. And so I lost the account. I told my little team, and we agreed I should fight for it. So when the sweet assistant told me they wouldn’t be going with me, I wrote this back, and I’m still not sure that to think about it. I know all about the financial realities of running a small business, and I wish I could give you more of a discount—but what I’m most proud of about my business is that we really “walk the walk” when it comes to ethics. 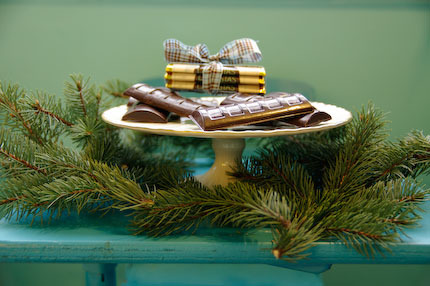 All our chocolate is organic and fair-trade, and we use as many local ingredients as possible in our chocolates. This ensures that many of the ethical problems with chocolate production, including the documented use of child slavery on cocoa plantations, are not present with my chocolates. I know you’re a socially-responsible business as well, and understand these complicated issues. One idea I’d throw out there is to spend the same amount (about $1000) but simply sending less chocolate–your clients will love the rich flavor of real, intensely-flavored chocolate, and I think they will appreciate the handmade artisan nature of our products as well. If you were to get 17 Big Assortments, the total would be $870 for the chocolate and $200 for shipping, so $1070, with complimentary gift wrapping. Thanks so much for your consideration and I look forward to working with you in the future. Not such a bad email, right? Except that I’ve been feeling weird for a month now that I used those same African child slaves as a way to get business. It feels weirdly exploitative that my for-profit biz worked the ethics angle so hard in order to land a big account. Everything I said was true and I stand by everything I said…but my stomach still gets a little wiggly when I think about it. Anyway, it didn’t matter. We didn’t get the order. We didn’t get the order, but we did get several other corporate orders that added up to more than $1000, and it was all OK in the end. For us. But even with my weirdness about the email, I was angry, and sad, and obviously I still am since it’s a month later and I’m writing a blog post about it. Partially I’m sad for myself, yes, but mostly because now a nice local non-profit is sending their clients chocolate packaged in outgassing plastic, made with chemicals and with cacao beans harvested in horrible ways, because they couldn’t pay $400 more dollars. I gave them the opportunity to spend the same amount of money on less chocolates, but they wanted the Big Bad Mainsteam Chocolate Company’s lavish boxes, with that wiry plasticky ribbon and the mountains of packaging. Can I blame them? A small business in New Paltz, New York that needs to look out for the bottom line in order to survive? Is the pot calling the kettle black here? I want to say no. 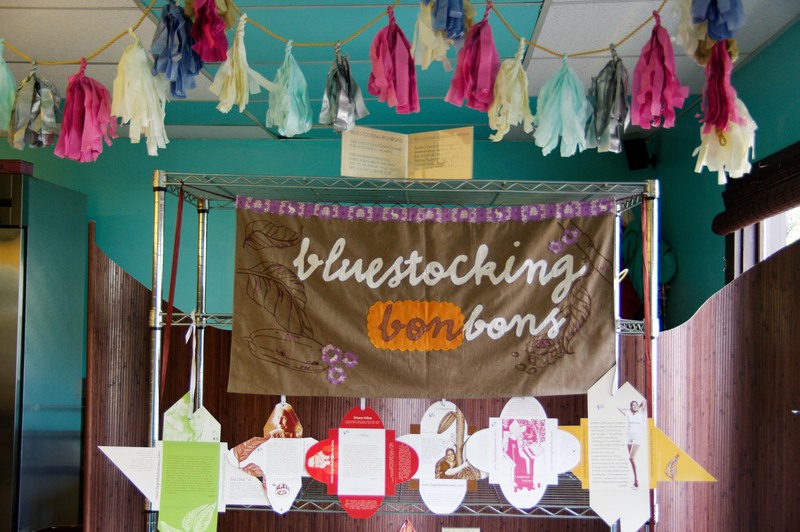 I want to say that I’ve made compromises too—only our Bluestocking Bonbons boxes are made with recycled paper printed with soy inks, our regular white and brown boxes are stupid dioxin-bleached paper boxes because I don’t have the funds for custom-printed boxes right now (want to loan me $10k? I’ll pay ya back!). I make compromises all the time, even though the number one purpose of my business is not to make compromises. It’s the nature of the world. 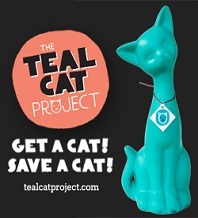 But this compromise, made by this non-profit in my little town, has been haunting me. And so has my email. It brought up something unpleasant about the ethics of running a capitalist business, about using money to make the world better. So there we are. I’d love your thoughts on the matter, you smart customers and friends and sweethearts, you. Oh and Noam, too, if you’re reading this, let me know your thoughts too, OK? Just how hard should I push the ethics angle when selling the chocolates? Noam? Anyone? Maresa’s vegan deviled eggs. Vegan. Deviled. Eggs!!! 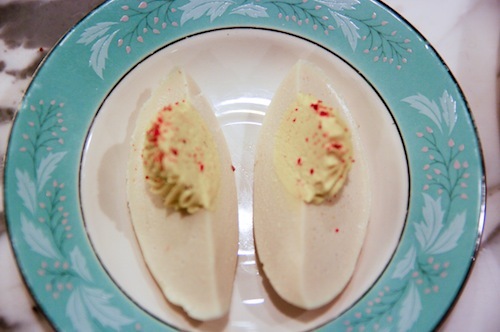 That taste and look like….EGGS! 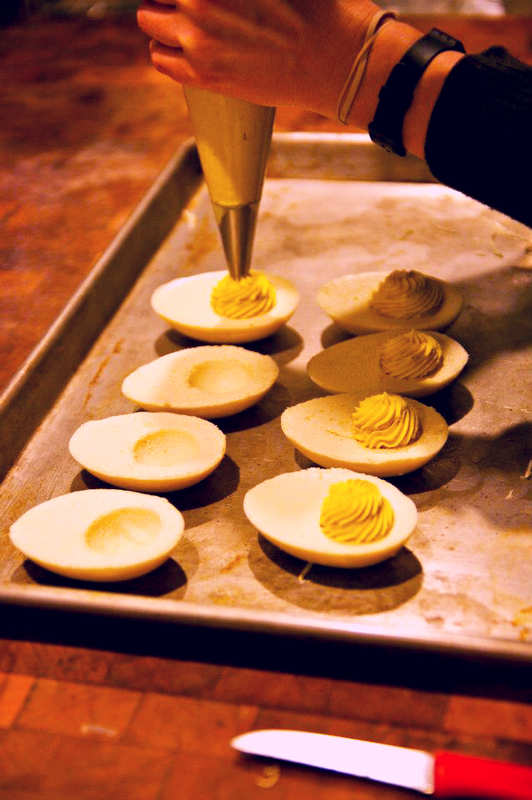 2015 NOTE: This post is so old & clunky, but I’m still making eggs like crazy. 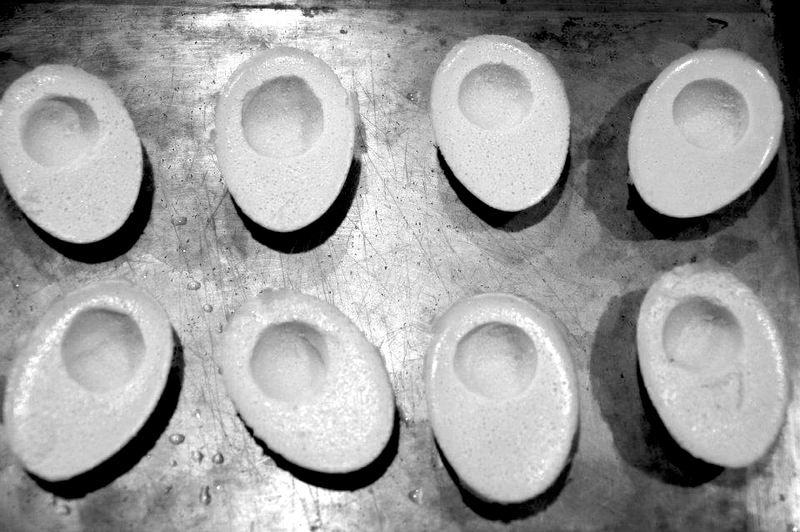 I have a lot of nice egg molds now, and laugh every time I see the ridiculous avocado-sized ones in the photos below. If you check out my Instagram account (@lagusta) I’ve posted about them a bunch with the hashtag #vegandeviledeggs—you might have to wage through some ones made with potatoes (ugh), but you’ll get to our beauties. This recipe was so good that a few years ago a cookbook author completely ripped em off and published the recipe in Veg News! And then another vegan blogger did same. Imitation / flattery blah blah. Yes, the recipe makes way more yolks than whites. You can halve the amount of yolks, but the yolks are really the tasty part, and I’m sure you’ll find lots of uses for them (egg salad!). Or, you can just double the whites recipe. I guess I could fix up the recipe too, but I gotta get to work! One last thing: I can’t stress enough the importance of unsweetened soy milk. Once I forgot that step. My god. 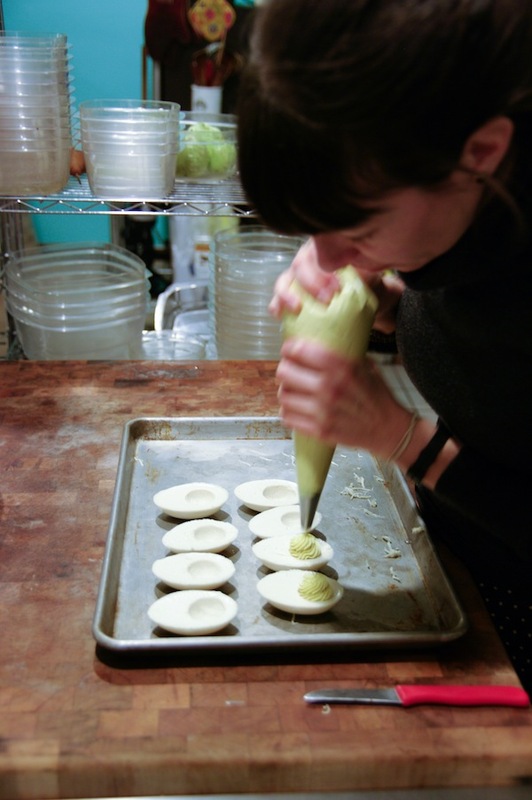 My BFF/right-hand-chocolatier Maresa and I have been talking about making vegan deviled eggs for years. This Thanksgiving we finally got around to it and I think the results are going to change your life forever. I CAN’T REALLY EXPLAIN IN WORDS HOW AMAZING THESE ARE. Great question! I usually hate stuff like this. We did it for a few reasons: 1. the fun challenge of nailing a taste and texture that are decidedly Not Vegan. 2. 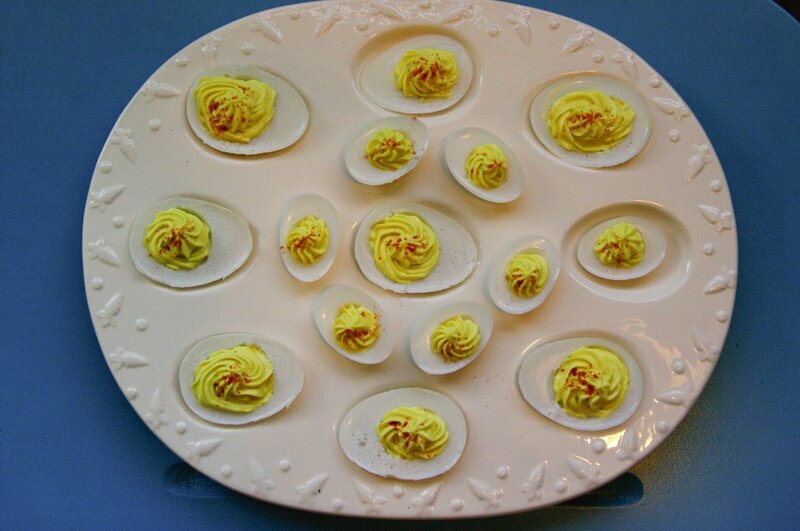 Deviled eggs, to me, taste good. I’m not vegan because meat and dairy and eggs taste bad- I’m vegan because those industries are too effed up to support. 3. Nostalgia. My grandma used to make deviled eggs and now she can’t, so someone’s gotta do it, and I’m not going to touch a chicken’s period. That said, Enjoy! Hope you make em if you want em! Hot damn I have a cool bestie. I know. 1) There are two magic tricks to this recipe, and if you don’t have ’em both, you can’t make it: black salt and agar powder. We got the idea to add black salt from Isa’s brunch book, and it’s invaluable—it’s what makes the recipe taste like eggs. You can get it at an Indian market, or I’m sure Google will find you some—make sure you’re getting Indian black salt (Kala Namak) and not regular old flaky black sea salt. Our advice: whatever you do, don’t stick your nose in the bag of it and take a strong whiff. 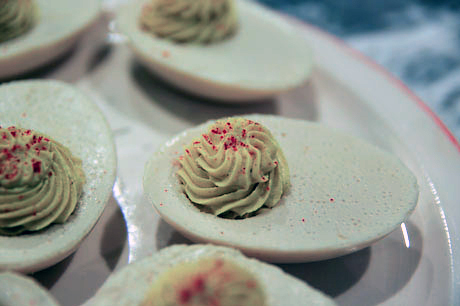 2) If you don’t have an egg mold, who cares? Square devils might not convert omnis so easily, but who cares about them? Make them in ice cube trays, little bowls, whatever. But once you start looking for an egg mold, I bet you’ll find one. The mold we used for this initial run is a giant metal one Maresa found at The Salv. Or, online: look at these cuties, or this one, for $90, that makes many petite eggs, or this sturdy workhorse. When I go to Montreal this spring to stock up on chocolate molds at Chocolate Chocolat, this mini-mold is going into my cart tout de suite. And maybe this cool textured one too. 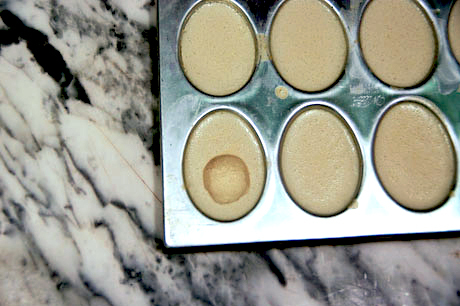 As Maresa points out in her cute first step (you can see the whole recipe on FB at that link, too), if you get a vintage mold, be sure to WASH WASH WASH.
3) This recipe is shamefully easy. Be prepared. The only thing is that two of the measurements are in grams (we work in grams, sorry!). If you make this recipe and have access to both a gram scale and regular ol’ cups and spoons, tell me the conversions & I’ll love ya forever. Even better, buy a gram scale! They’re only like $20, and it will change your cooking life. Bring all ingredients to a boil. 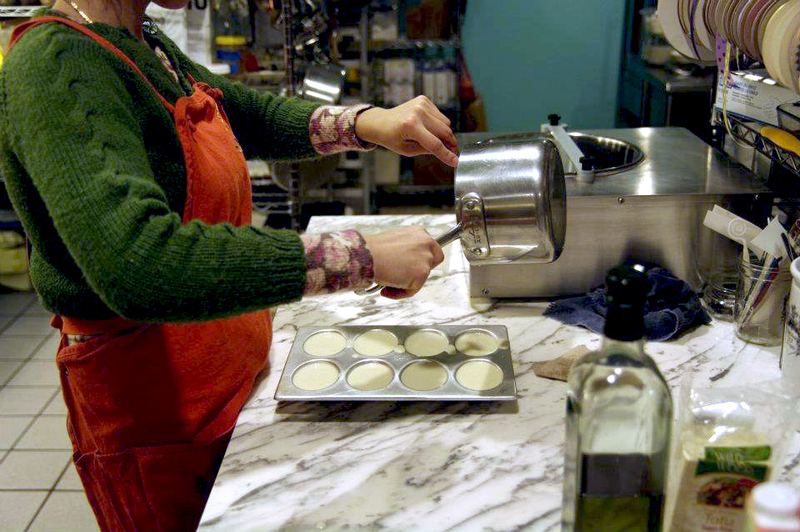 Pour into molds and refrigerate until set up (about 30 minutes). When the whites set up, use a teaspoon measure (or melon baller) to scoop a bit out. This is where you will pipe the yellows. Using an open star tip and pastry bag, pipe yellows into whites. Garnish with paprika. Now if you’ll excuse me, I’m off to look for deviled egg platters at Goodwill. Happy egging! DECEMBER 19 IS OUR LAST SHIPPING DAY FOR PRIORITY SHIPPING AND DECEMBER 21 THE LAST SHIPPING DAY FOR OVERNIGHT SHIPPING. 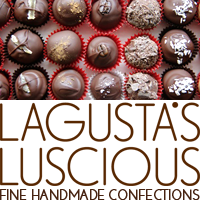 Thus, since we make chocolates from scratch, chocolates need to be *ordered* by December 17 for Priority Shipping and December 19 for Express Shipping. Thank you!